I spent last weekend in Flanders, in the beautiful city of Gent (or in English: Ghent). City of Medieval towers, quiet canals, overcrowded Christmas markets, and of pubs. At the Sunday book market alongside the Ajuinlei, I stumbled upon the Gentsche Kroegenboek, which roughly means ‘Ye olde Gent pub book’. Published in 1985, it describes the fifty best beer cafés of that moment. Which of course prompted a comparison: where are those pubs now? And: how is the beer doing, 32 years later? 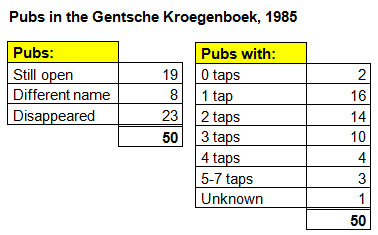 Although the public house has been celebrated throughout the ages, the trend of writing surveys of drinking establishments that are actually practical and even touristic dates from the late 1960s, or at least in the Benelux: the first was the Groot Amsterdams Kroegenboek (‘Great Amsterdam pub book) by Ben ten Holter, from 1967. An overview of interesting, cosy, intellectual and messy cafés in the capital of the Netherlands. But also in the English-speaking world, the earliest Pub Guide I could trace only dates from 1969. 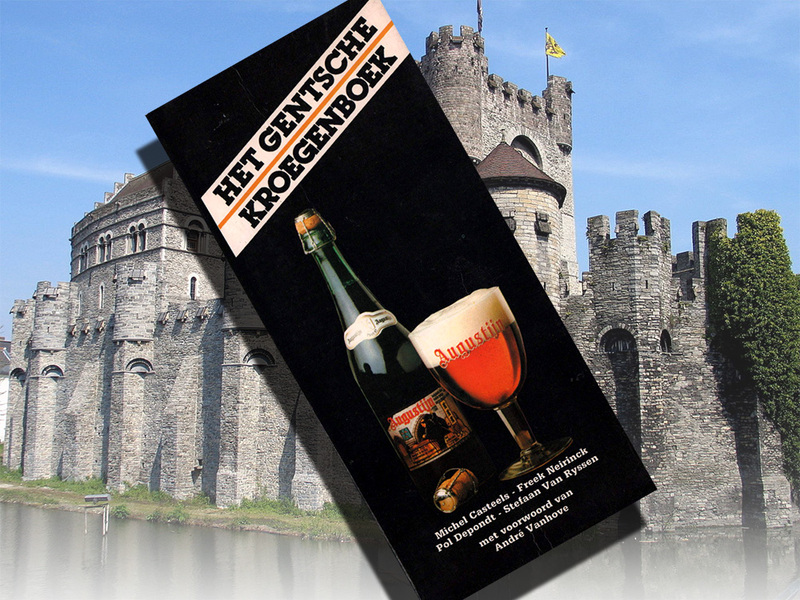 After Amsterdam also the Dutch and Belgian cities of Eindhoven (1972), Groningen (1981), Brussels (1982), Antwerp, Utrecht, Rotterdam, Nijmegen and even tiny Terneuzen (all in 1984) got their own pub guide, and in 1985, it was Gent’s turn. Such a guide is of course a document of its time. While reading it, you can make an imaginary trip back to the days of thickly bearded, smoking students in denim jackets, philosophising about the Bomb, the communist manifesto or David Bowie’s new album. Accompanied by a Belgian beer, because for every pub the guide mentions which beers were on draught and available in bottles. Which is of course handy for a beer historian. A cross section of the beers available in Belgium at the start of the comeback of good beer. A year later, in 1986, 79% of Belgian beer production was still of the pilsener type, but by 1991 this had sunk to 71.5%. I guess you have to be a geek like me, but browsing through the guide I could not help myself but wondering: how many of these pubs still exist? After all, time is constantly nibbling at the status quo. What today is a good pub, will be a bad pub tomorrow, and will be gone the day after tomorrow. It cost me a few hours of googling, but then I could draw the sobering conclusion: of the fifty pubs in Gent that were worth describing back in 1985, 23 have disappeared. Almost half of them! Another eight now carry a different name. Only 19 of the 50 still exist, in some form or another. It’s an illusion to think everything is forever. 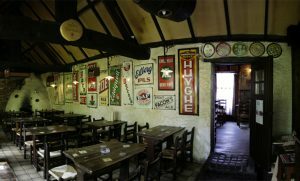 One pub that is sadly missed is Kaffee De Hopduvel, one of the pioneers of Belgian specialty beers. Some 130 different top-fermented beers were available, to be enjoyed with a cheese platter or a ham sandwich. In the early 1980s, landlord Toon Denooze was also the man behind the first poster with all Belgian beer labels on it, 330 in total. In 2011 this monument of beer culture, where hundreds of old publicity signs were on display, closed its doors. The beer shop with the same name still exists. It is of course of some interest to take a look at what beers were on sale in Gent back in 1985. On average, pubs had only two taps: one with pils and one with another beer like Hoegaarden, Rodenbach or something else. Sixteens pubs even had just one beer pump. The highest number of taps was seven, in the now defunct pub Artevelde on Sint-Pietersnieuwstraat. Though the range of beers looks slightly more limited than nowadays, all great classics we know now were already represented: white beer (at that time only Hoegaarden), oud bruin (Rodenbach, Bacchus, Zulte), abbey beers (among others Leffe, Tongerlo, Sint-Idesbald, often erroneously referred to as ‘trappists’), real trappists, and quite lot of Duvel (but otherwise hardly any other ‘alcohol bombs’ from those days). Gueuze, pale ale, stout and scotch were all over the place, apparently slightly more so than today. Also, there was some Danish beer in circulation, like Carlsberg and Tuborg. There were some now-lost beers as well: the afore-mentioned oud bruin Zulte, but also the failed luxury pils Loburg by Artois, and two beers by the Aerts brewery from Brussels: the Speciale Aerts (an amber beer not unlike Palm), and Aerts 1900, a beer introduced in 1979 following a recipe from the early 1900s, at 7.4% ABV. 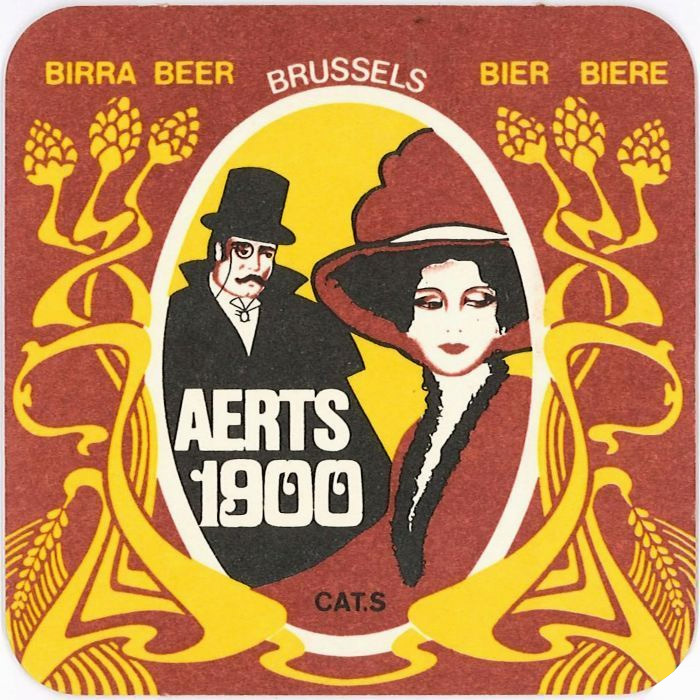 Today, the Haacht brewery still makes a ‘Speciale 1900’ named after these, it is even recognised as a Flemish regional product, but at Aerts Speciale and 1900 were two different beers. Also, there were various amber-coloured beers like Vieux-Temps, Op-Ale and Horse-Ale, and although today they are still in production at InBev, they are only a shadow of their old self: to Vieux-Temps they now even add an ‘E-number’ colorant! But lost beers notwithstanding, it looks like beers in Belgium last longer than the pubs where they are served. You could call that a lack of innovation, but to me it’s a sign of wisdom: why would you, as a drinker, follow each and every new trend, when beers like Westmalle, gueuze and oud bruin are good and stay good? They are the grand crus of beer land, superior in 1985 and in 2017, as long as they are not milked dry like InBev does with Vieux-Temps. The Gentsche Kroegenboek, with its many disappeared pubs, can put you in a nostalgic mood. But there is no need to be sad, on the contrary. 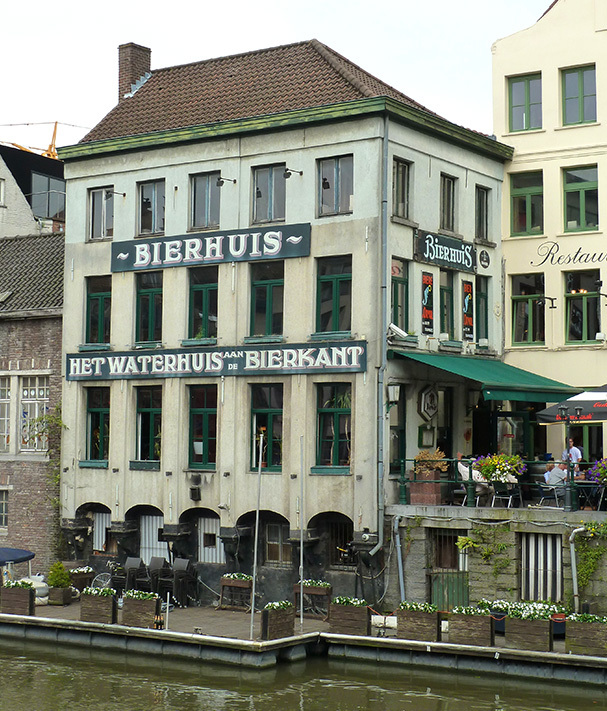 Some beer temples mentioned in it, like the Waterhuis aan de Bierkant and Dulle Griet, are still crammed with people. 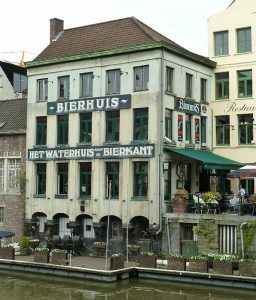 And although many pubs have disappeared, a whole range of new cafés and beer-minded restaurants have been added to the scene: the Trollekelder, Aba-jour, de Geus van Gent, het Spijker, the remarkable Velootje, the robust Stokerij and of course city brewery Gruut, to mention a few. Plenty of reason to visit Gent again soon. B. ten Holter, Groot Amsterdams kroegenboek, Amsterdam 1967; Egon Ronay’s 1969 pub guide to England, Scotland and Wales, London 1969. That said, I would not be surprised if there are earlier examples. Pub literature in a broader sense is of all ages: a less practical but more poetic example is A vade-mecum for malt worms from 1718, about London. Michel Casteels et al., Het Gentsche Kroegenboek, Antwerpen 1985. In 1982 also two books about the Netherlands and Belgium as a whole were published. Other guides were, among others, about Limburg (1985), Maastricht (1986), Breda (1987), Leuven (1988), Arnhem (1992), Dordrecht (1995). Jos Cels, Honderd jaar bierhandel, Zellik 1993. Compare the labels on beerlabels.nl and catawiki.com. 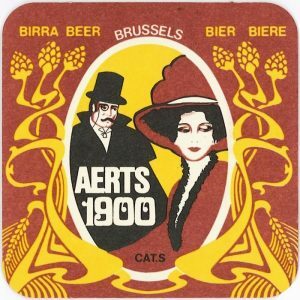 Aerts 1900 was 7.4% ABV and category S, while Speciale Aerts was 5% ABV and category I.
I love reading post like this. It is a great way to understand rich beer cultures. I recently visited Brussels for the first time and loved how people of different ages enjoy a great beer with a meal in cafés or restaurant. Thanks for sharing this. Greetings from Chile!